The depths of Jim Lewis’ great work have yet to be measured. Exploration of his Astro*Carto*Graphy® Map of the U.S. (July 4, 1776, 4:47 PM) amply demonstrates this. This map has proven itself both a worthy compass and forecasting tool tying the U.S. and her leadership in Washington, DC into a vast Unified Field. Within this Field, America’s relationships to every point across the face of the Earth are marked with baselines that allow one to measure where, when, and the nature of events important to the U.S. This Unified Field also pulls seemingly unrelated far-flung places together. The symbolism marking out the Field’s grid also links the U.S. into a vast time continuum that ties the most remote past to the present and lays out roads into the future. The Moon lines (zones) in the U.S. Astro*Carto*Graphy® Map provide extraordinary insights into the mood of the American people. For the nation, this Moon signifies issues concerning water and food supplies, family values and security, legal and illegal immigration, trade and the national defense of the United States’ borders and interests worldwide. 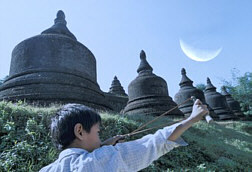 Historically, the major Moon Zones have focused American attention to a host of widely separated places ranging from Berlin; Brussels; Paris; also Monrovia, Liberia; New Delhi; Colombo, Sri Lanka; Alma Ata, Kazakhstan; The Republic of the Marshall Islands; The Kurile Islands; Mexico City, Mexico; and a multitude of sites through America’s Heartland. In addition to these major vertical and diagonal zones, there are horizontal zones formed off of PARANS [to the U.S. Moon] worth exploring. The Paran, known by ancient astrologers, is a spot on Earth where the observer can witness two or more planets, or stars simultaneously on the angles between Earth and Sky. These planets can be rising (ASC) on the Eastern Horizon, setting (DSC) in the West, or directly overhead (MH) and opposite that point (IC) beneath the ground. While the ancients gave prominence to the point where the Paran was exact, Jim Lewis expanded the qualities represented by the astrological bodies East and West latitudinally around the Earth. Parans to America’s Moon lines place special emphasis upon the 19th, 28th, 40th, 52nd, and 54th Latitudes North. The 28th Latitude South is also significant. Within one degree (sometimes more) north and south of each of these latitudes are cities recently important to the U.S., where she has faced either a crisis or a defining moment between August 21 and November 6, 1994. The 19th Latitude North Zone (conservatively 18°- 20° wide) sweeps: Port-Au-Prince, Haiti (18° N 40’); Mexico City, Mexico (19° N 24’); Guantanamo Bay Naval Station, Cuba (20° N 00’); Surat, India (21° N 10’); Bombay, India (18° N 58’); and Hanoi, Vietnam (21° N 02’). The 28th Latitude North Paran Zone (27°- 29°) touches Kuwait City, Kuwait (29° N 30’), a place still hot from recent tensions during October/November 1994. The 40th Latitude North Paran Zone (39°- 41°) encompasses places ripe with historic and geopolitical importance to the U.S., many of them capitals. Moving West to East, the zone includes: Pyongyang, North Korea (39°N04’); Beijing, China (39°N55’); Baku Azerbaidzhan (40°N23’); Tbilisi, Georgia (41°N43’); Ankara, Turkey (39°N56’); Naples, Italy (40°N50’); and Madrid, Spain (40°N24’). Moscow, Russia (55°N08’), America’s nemesis for five decades, falls in the Paran Zone surrounding 54° North Latitude (conservatively 53°- 55°). Jump down South to the 28th Latitude Paran, which we find passing between Johannesburg, South Africa (26°S15’) and with a generous stretch, Umtata (31°S35’), the birthplace of Nelson Mandela. Remember the Zone is 2 or more degrees wide (conservatively 27°- 29°). Stories from all of these places were major headlines in U.S. newspapers throughout the Summer/Fall 1994, when this article was written. 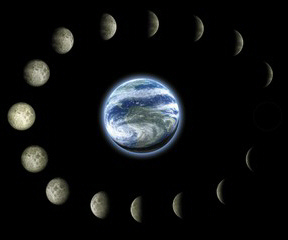 In a predictable manner, during this period, multiple stories (from different Moon Zones and Parans) have appeared simultaneously. For examples, in mid-September, The Sacramento Bee Newspaper carried a front-page story on Cuba, Haiti, North Korea, and Pittsburgh, Pennsylvania. The Cuban and Haitian stories came from the 19th Paran, while Pittsburg and North Korea originated on the 40th Paran a half a world apart. These stories have no rational connections until you look at the Moon Zones and the grid they form in the U.S. Astro*Carto*Graphy® Map. Washington, DC [38°N56’] is connected to the 40th Latitude North Paran, thus tying into the entire network of Moon Zones making a Unified Field System connecting the nation’s capital with the capitals of other major powers around the world. New York and Philadelphia, the nation’s first capitals, are also part of the field’s web. In addition to these, 19 state capitals across the country are tied to Washington, DC because they are all located within the 40th North Paran Zone (conservatively 39°-41°). 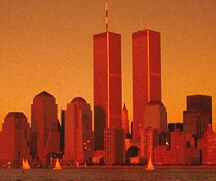 New York Cities’ 9/11 (40° N 41’), and Madrid, Spain’s 3/11 (40° N 24’) occurred within the heart of the 40 North Zone. The U.S. Central Command running the War against Terrorism is located in Tampa, Florida (28°N00’) and in the Persian Gulf (around same latitude). Central Command has established airbases in Central Asia (40° North Zone near Tashkent) to facilitate the Afghanistan war. Most recently, the paths of two hurricanes (Charlie and Francis) have crossed in central Florida, exactly at 28° North, between Orlando and Tampa. The Mercury Direct Station on 9/2/04 at 25° Leo +, triggered the U.S. Moon position (26° Aquarius 56’) at the foot of a YOD, and timed the hurricanes, as well as other developments along 19° and 40° North.